Over the years I have fine tuned a lecture in response to this offense that I will now publish for your benefit. I do this in hopes of warding off future holiday puns in direction. Oh, and some of you might find it vaguely interesting. And NOW… The difference between holly and mistletoe! This is holly: an evergreen tree or bush that has spiky green leaves with pointed ends, and red berries. This is mistletoe: a vine that grows in a clump on other plants. It has round green leaves, and white berries. Aside from the fact that they look nothing alike (except for the fact that they are both, you know, plants! ), the two have very different characteristics, and different winter holiday origins, traditions, and associations. 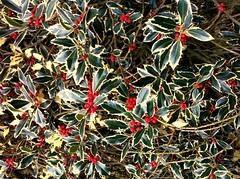 Holly is an evergreen plant with red berries that emerge in fall. During the dark and barren days of winter, holly has always been prized for its fresh green leaves and bright berries, signifying growth and fertility – hope and a reminder of springtime to come. The Romans used it in their winter celebrations known as the Saturnalia, and this custom may have spread to England. In ancient times various peoples believed the holly was sacred. The Celts thought this plant stayed green year round because it was especially favored by the gods. Holly has an association with protection throughout the ages. It was hung about the doors and windows to keep away witches, spells, evil spirits, and goblins. Builders made cottage doorsteps of holly wood so that witches could not enter. In Norse mythology, holly was thought to offer protection from lightning strikes sent by Thor, the god of thunder and lightning. 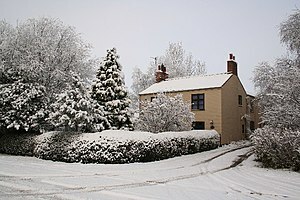 Holly trees were often planted nearby a house, to attract lightning strikes away from the home (preventing possible fires). Oddly enough, this is one tradition that has scientific evidence to back it up. Scientists have recently found that holly acts as a sort of natural “lightning rod”! The pointed leaves disperse energy blasts, and the tree trunk grounds the plant in such a way that it does in fact act as a natural lightening rod. For some ancient cultures holly was used in divination spells, and in dream interpretations. Others considered to be a man’s plant and is believed to bring good luck and protection to men, while ivy brings the same to women. 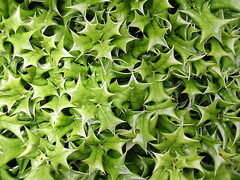 It is thought that whoever brings the first sprig of Christmas holly into the home will wear the pants that year. Holly has been incorporated in Christmas and winter decoration in Europe (along with ivy, fir and other evergreens) since the Middle Ages. The Christianizing of many early pagan festivals and symbols that were eventually appropriated as Christian symbols of eternal life and the promise of springtime, apply somewhat to holly. Its sharply pointed leaves have been used to reference Christ’s crown of thorns, while the berries have been said to represent the blood Christ spilled on the cross. In Christian times, holly branches were often cut to adorn churches during the holidays. But in most places in Europe the burning of the holly meant the death of winter. English tradition said that at summer’s end, the Holly King fought the Oak King for rulership of the year, and reigned over the dark months. At winters’ end, another battle was fought, and the Oak King won to rule over the summer months. This tale was enacted in the legends of medieval romance. Sir Gawain and the Green Knight enact the play at Arthur’s Court in Camelot. The Green Knight bears a great bush of holly as his insignia. Before the Christmas tree came to England in the nineteenth century, a great ball of evergreens and holly berries hung in cottage or hall, decorated with ribbons, paper roses, apples and oranges. In Yorkshire, girls carried a holly bush similarly decorated on wassailing ceremonies around the orchards. In 15th century London, poles garlanded with holly and ivy were set up alongside Christmas sports. In some places, Christmas holly had to be burned at Twelfth Night, or ill-luck would follow. It’s easy to see why ancient people would have been fascinated with mistletoe — it’s not a typical plant. Mistletoe is a parasitic vine. That’s right! A parasite: It exists by digging its roots into the bark of trees, like oaks and birches and living of their life source. It flourishes green even in wintertime when the ‘host’ tree is bare-limbed. This evergreen quality and its ability to pop up and thrive in winter while other plants are seemingly dead resonated with ancient ideas about fertility and fecundity. In ancient times, it was associated with the Greek goddess Artemis – who was said to wear a crown of mistletoe as a symbol of fertility and eternal life. The Druids believed the mistletoe berry would make barren animals fertile. Baldar, the god of the summer sun, saw in a dream his death. Frigga, his mother and the goddess of beauty and love — and from whom we get the name Friday — compelled the elements, plants and animals to not kill Baldar. But she neglected to extract this same promise from the unique mistletoe. The evil god Loki (brother of Thor) … fashioned a poisoned dart from mistletoe and with the aid of Baldar’s blind brother Hoder shot the mistletoe missile to kill Baldar. His death brought winter and his mother’s lamentation. However, the tradition of kissing under mistletoe doesn’t commonly appear in any literature until around the 18th-century. The practice seems to have especially flourished during the 19th century Victorian era. A ball of mistletoe, ornamented with ribbons, would be hung around Christmastime, and no unmarried girl could refuse a kiss if she was underneath it. These muddled origins and associations of both plants aside, I hope you are now mmore aware of the diferences between these two holiday plants, and their celebratory origins and associations. Hang them. Have fun with them. Pass this lecture on to other if you like. On behalf of all the Hollys out there, the one thing I ask you take away from all of this is – please don’t attempt to bond with me by wrongfully utilizing a parasitic vine!